1. 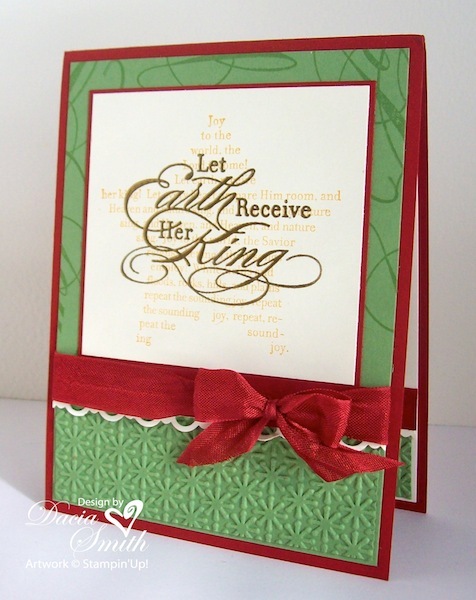 Add elegance to your stamped message using Gold Embossing Powder over the star stamped off image in More Mustard. 2. The Joy sentiment and the Snow Burst Embossing Folder add texture to the background of this festive holiday card. 3. Tie easy bows in a snap with the Cherry Cobbler Seam Binding Ribbon. The smooth lightweight material adds the perfect finishing touch for your special Christmas card share! 1. Decorate for the holidays using this Christmas Pine Cone adorned with the Holly Berry Bouquet Designer Series Paper. 2.Top off your cone with a ribbon embellishment using Pear Pizzazz Seam Binding Ribbon and a Real Red Taffeta hanger. 3. The ornament measures 2″ wide and 3″ tall. The base is a styrofoam egg covered with folded paper petals attached with sequin pins. All content (including text, photographs, and design work) is copywright Dacia Smith. My artwork (all original unless otherwise stated) is shared only for your personal inspiration and may not be copied for publication or contest submission. All supplies are from Stampin' Up unless otherwise stated.